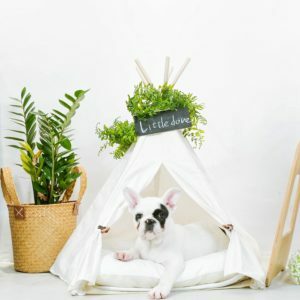 A beautiful small dog pet house like a teepee bed is one of the most unique and special types of beds that you can get for your furry friend. This is a particular type of bed that has an attractive look that adds a nice touch to any room that you want to add it into. 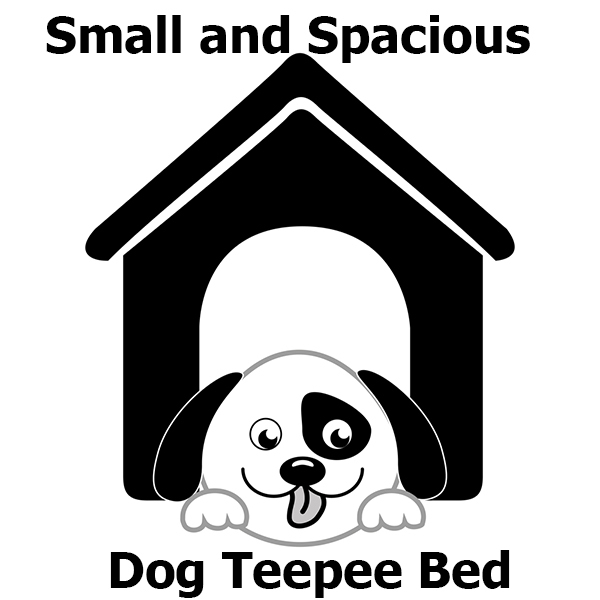 A small and spacious dog teepee bed is designed to look like a traditional teepee. That is, it has a series of supports that move inward towards the middle to create a canopy. This will feature a nice cloth or other fabric to create a series of walls with a singular opening in the middle. This opening allows your dog to sleep in it. This is an appealing type of furry friend pet house that adds a nice look without taking up far too much space in your home. It can also be used as a portable bed for when you are traveling with your dog and can even be broken down and quickly set up again as needed. But to make such a great pet bed like this work, you have to look at what options are available for sale. There are a number of attractive dog teepee bed choices for you to look for right now. A dog teepee bed is typically designed for smaller dog breeds. It is not necessarily something for larger dogs to sleep on. 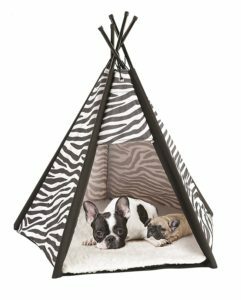 In fact, many of these dog teepee beds that you will read about here are designed with both dog and cat use in mind. This first choice from Little Dove has an attractive design that is 24 inches tall and 20 inches in diameter. It is great for dogs that are up to around 15 pounds in weight. This is made with a cotton canvas and has a series of pine poles. These are very easy to assemble and can be secured along the base on the bottom part to create an attractive and even look. The assembly process only takes a few moments. This is also flexible in terms of the type of sleeping surface you can add at the bottom part of the bed. 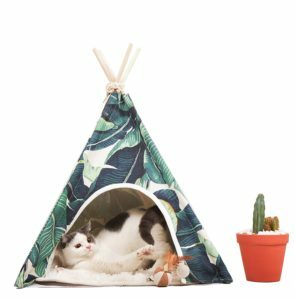 You can always add your own cushion or bed or you can order this pet teepee with a special cushion that comes with it. This is a little larger than the Little Dove model. It is about 26 inches wide and 27 inches high. It comes with its own fleece pad. This can be removed and washed as necessary. It can also be secured to the teepee with a hook and loop fastener setup. The tent can collapse and be put back together again in moments. This allows you to transport and store the pet tent quite well when not in use. The locking fasteners ensure that you can get the tent set up properly without worrying about it breaking down while in use. 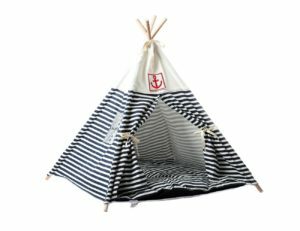 At about 23.6 inches on each side and 25.5 inches in height, this attractive teepee has a comfortable space for sleeping. It has a navy stripe design available in a black or red color with a white base. The canvas materials around the entire teepee create a great space for sleeping that blocks out light. It also repels water so it will be perfect for indoor and outdoor use alike. The cushion has a soft fabric interior while the cotton canvas cover creates a relaxing surface for your dog to sleep on. The assembly process is also easy to handle. Insert the proper posts into the fabric at the right spots and then add the cushion in the middle. You can fold it down quickly when not in use as well. Find this particular My Market bed in four designs. Each is 24 inches tall and 20 inches in diameter. The cotton canvas material blocks out the sun and can handle moisture well. The wooden pine poles also stay intact for a while and will not break down quickly. This offers a comfortable surface for your pet to sleep under.You can also add your own blanket, bed, or other soft surface onto the bottom part of the bed. There is enough space on the inside for you to add a small cushioned surface into the area. This next choice comes in two different sizes. You can order a smaller one that is 20 by 24 inches or a large option that is 24 by 28 inches in size. Each option is made with a cotton canvas surface and a series of pine poles. The tent is easy to assemble and take apart while also being very easy to transport. 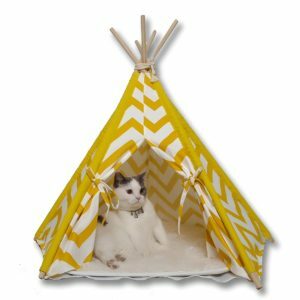 The attractive look on the pet teepee comes with a body that allows you to quickly decorate it in a variety of ways. You can add a small size to the top or even a floral accent. The top base on the teepee lets you add anything you want onto its body. You can also add your own small sleeping surface onto the bottom of the teepee. Finally, you can use this 24-inch teepee as a comfortable surface for your dog. This uses a cotton canvas fabric with pine poles while having a soft surface on the bottom. 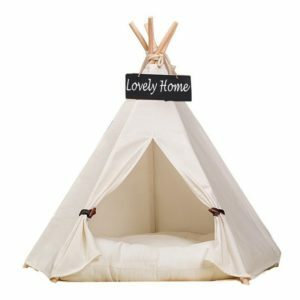 While this surface is relaxing and offers enough padding over the floor that you place the teepee on, it does offer room for a separate blanket or pad. With a diameter of about 20 inches, it should be easy for you to apply a great pad onto the bottom part of the bed. An attractive dog teepee tent bed will create a great space for your dog to sleep on. Make sure you look for a great pet tent when finding a nice spot for your dog to sleep at. The pet bed options here are all great choices to take a look at in any case… for once your furry friend will be happy to be sent to the dog house!